Why a Specialized Local Installer is the Better Choice | West Coast Solar, Inc. If you’ve been considering going solar, you know there are lots of choices out there. There are the big national companies and the smaller, local installers. So what makes them different? A huge national company is like a fast food chain. Your experience might not be terrible, but it won’t be special or tailored to you. With a specialized local installer, your team knows the area specifically and will be able to provide a relatable, customized experience. With a huge corporation, you’ll be treated like a number. You’ll speak with multiple people on the phone and never meet them, so they won’t feel responsible or accountable. With a local installer, you’ll get to know the team and they’ll know you personally, so there will be respect and a deep level of accountability. Who do you think installs the projects for national installers? They aren’t the ones driving out to complete the project, but just hire subcontractors. This means lots of things can get lost in the shuffle. A local installer has an in-house team of specialists that will be the ones to personally complete your project, so the people you talk to on-site and on the phone are one and the same. Large national companies don’t have a lot of skin in the game, so if they do a poor job, they’ll just move onto the next project without another thought. 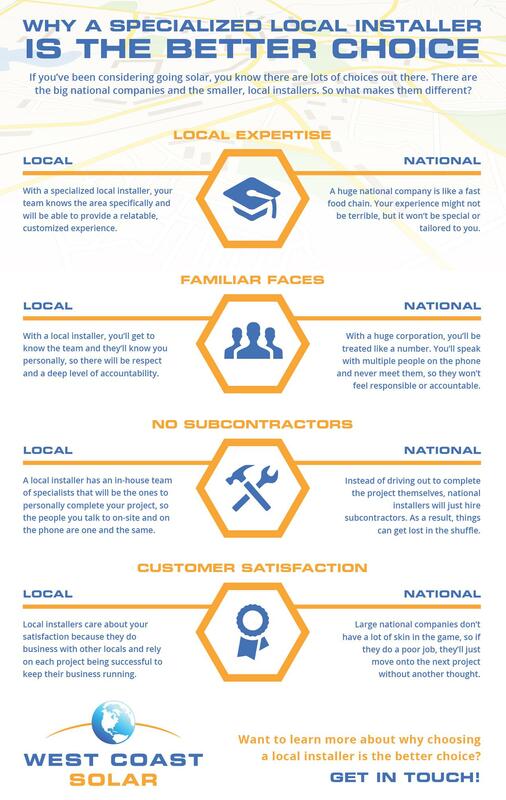 Local installers care about your satisfaction because they do business with other locals and rely on each project being successful to keep their business running. Want to learn more about why choosing a local installer is the better choice?